Running burns an insane amount of calories and it also targets your tush and legs, so it's the perfect workout if you're trying to slim down and tone up below the waist. Add hills to your workout and you'll tone your lower body even faster and more effectively. If you're new to hill work or tend to skip out because running on an incline is challenging, walking briskly will do the same magic. This interval workout combines walking hills and short sprints with just a bit of incline to reduce the chance of developing shin splints. Aside from a toned tush and thighs, intervals are also proven to target belly fat, so it's doubly effective. In about 40 minutes, you'll burn over 400 calories! You don't have to brave the cold to fit in an effective hill workout. 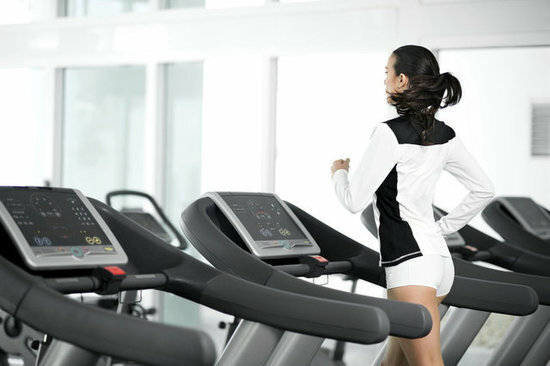 Set the treadmill incline to one, and after warming up begin this workout. For each three-minute brisk walking interval, you'll need to raise the incline to 15 percent (or as high as it'll go), and for each 60-second sprinting interval, you'll need to lower it to one. Adjust the speed as necessary if either the walking or sprinting pace seems too slow or fast.